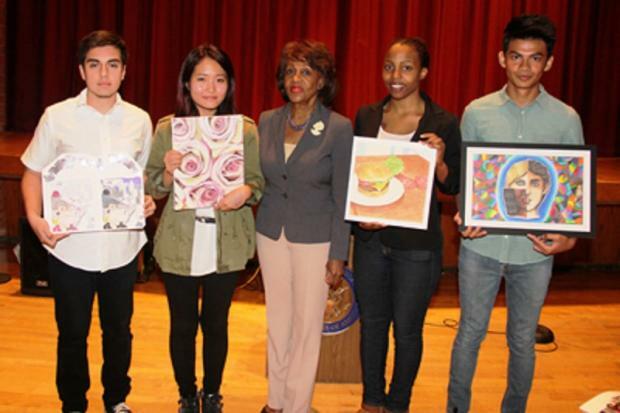 On Wednesday, May 1, Congresswoman Maxine Waters (CA-43) recognized 24 high school students of the 43rd Congressional District who participated in the 2013 Congressional Art Competition. Students, teachers and parents were joined by Congresswoman Waters at the Nakaoka Community Center in Gardena, Calif. for a reception to honor the students. Since its inception in 1982, over 750,000 high school students have participated in the nation-wide Congressional Art Competition. This year’s participants included students representing eight high schools across the 43rd Congressional District. The first place prize winner is Christopher Lizama of Leuzinger High School (Lawndale), where he is taught by Mr. Kyle Jennings. Christopher will have his artwork displayed in the Nation’s Capitol for one year. He will also receive two complimentary, round-trip plane tickets to Washington D.C. for the official unveiling ceremony at the U.S. Capitol on June 26. The second place award was presented to Adrian Sanchez of St. Bernard Catholic High School (Westchester), where he is taught by Mr. Ron Baum. Adrian’s piece will be showcased in the Congresswoman’s Washington D.C. office during the coming year. The third place winner is Soohyun Park, who studies at Torrance’s North High School and is taught by Mr. Justin Yeom and Ms. Alissa Park. The fourth place prize was awarded to Adilah Trimble, of Inglewood High School, where she is instructed by Mr. Clifford Johnson. Soohyun and Adilah’s artwork will be on display for the next year in Congresswoman Waters’ Los Angeles office. (L-R) 2nd Place winner, Adrian Sanchez, a senior at St. Bernard Catholic High School in Westchester; 3rd Place winner, Soohyun Park, a sophomore at Torrance North High School; Congresswoman Maxine Waters (CA-43); 4th Place winner, Adilah Trimble, a senior at Inglewood High School; and 1st Place winner, Christopher Lizama, a senior at Leuzinger High School in Lawndale.